fissure-controlled pyroklastic cones and craters, many of which are filled by crater-lakes. 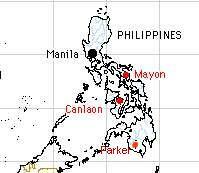 Philippines traveled 33 km to the SW from Canlaon. 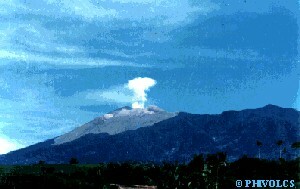 of small-to-moderate size that produce minor ashfalls near the volcano. 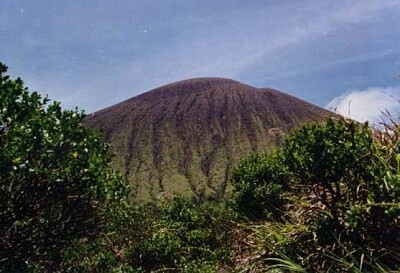 SE, which settled predominantly over the mid-upper slopes of the volcano. earthquakes and low-frequency short-duration harmonic tremor events increased. 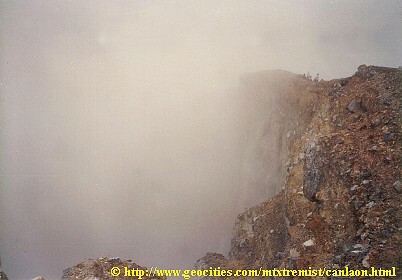 This coincided with phreatic episodes between 8 June and 23 July 2003.
and seismic activity returned to low levels. Latest news always on top. Below are previous activity. observed at an altitude of 7.6 and 11.3 km by aviators. as extending SW for 110 km. warned the public to stay outside the 4-km-radius permanent danger buffer zone. dirty-white steam that rose 100 - 150 m before drifting NE. On 11 August more emissions of white steam were noted between the hours 0353 and 0500.
guides, and two British visitors accompanied by a local guide. retrieved the day after by helicopter.*). crater rim down to Bacolod Sunday. rescue them. Most of the injured were treated for serious burns. ash eruption only. Present activity slight emission of white steam. No lava flow observed. 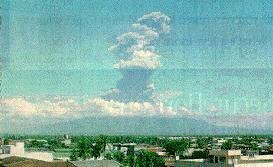 Eruption consisted of ash laden clouds, air shock manifested during eruption. Ash deposited on W slope of volcano. molten lava; very little change in physical and biological environment. Present activity is quiet.